What do Oxford and Bristol, two seemingly very different cities, have in common? Skylines under threat; insurmountable transport challenges; ugly in-your-face-developments; an expanding student population and a shortage of affordable housing. Quite a lot, it turns out. This is what members of the Bristol Civic Society found in June when they were led on walking tours of the ‘city of dreaming spires’ by their Civic Society counterparts in Oxford. Alongside the sublime classical buildings, we were privileged to be shown several of the more recent prestige college developments. This included the Blavatanik School of Government (photograph above) housed in a building developed by Herzog & de Meuron. A sumptuous, clean cut, whirl of a building, giving more than just a passing nod to Frank Lloyd Wright’s New York Guggenheim. We also visited the Rafael Viñoly Architects designed Mathematical Institute, a homage to subdued cubism on the outside, Escheresque on the inside. 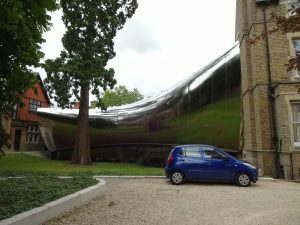 But most outstanding of all, was Zaha Hadid’s emphemeral, stainless steel, Stirling Prize winning ‘tunnel’ for the Middle East Centre at St Antony’s College. A Marmite building that jumps out as you walk along the suburban Woodstock Road. Linking two Victorian brick houses – it both shocks and awes. Not all the developments were so arresting. We were shown a block of student houses that ‘slipped through the net’ challenging the world famous vista from the bucolic Port Meadows to the dreaming spires. We also viewed some interesting vernacular architecture – mostly pub interiors. Thank you Sir Clive Booth and colleagues of the Oxford Civic Society for an informative, educational and entertaining day.